JEFFERSON - Jefferson Elementary School revved up a new initiative during an assembly on Tuesday, March 5. As students were encouraged to make “motorcycle noises,” their teachers came riding into the gym on tricycles, bikes and more. Then, Principal Steve Candela was told he had to make his own motorcycle noises, too, since the students all did. motorcycle, with third-grade teacher Julie Meyer dressed as a mouse and his passenger. The students cheered in excitement. The fun was all part of the kick off to One School, One Book, a new program that involves everyone in the building reading the same book, “The Mouse and the Motorcycle,” a children’s novel written by Beverly Cleary and published in 1965. Candela credited fourth-grade teacher Tara Reed for spearheading the initiative to get all of the school on the same page. During the assembly, Candela and teachers unveiled the title of the book, although multiple students guessed the title before the announcement, as they had received clues in the library leading up to the assembly, like a trash can, apple core and giant piece of cheese. “We want to stress to you the importance of reading. Not just the importance of reading while you are inside our school building, but the importance of reading for the rest of your life,” Candela said. Candela told the students how excited everyone in the building and the community is for what they will be doing with the book. He noted how Superintendent John Montanaro was in attendance for the assembly, along with Jefferson Police Chief Dave Wassie and some of his officers and PTO parents. As part of One School, One Book, Candela said that everyone in the building will be reading the same book, “The Mouse and the Motorcycle,” and reading it at the same time, with each of them receiving their own copy. Each night, they will read one chapter of the book. “If you can’t read this book, have your parents read this book to you,” Candela said. He even encouraged older siblings to read to their younger brother or sister. “We want you to talk to your friends at school about the book,” Candela said. Every morning, a trivia question will be asked over the morning announcements. Correct guessers will be entered into a daily drawing. Teachers also will have a stuffed mouse in their room. 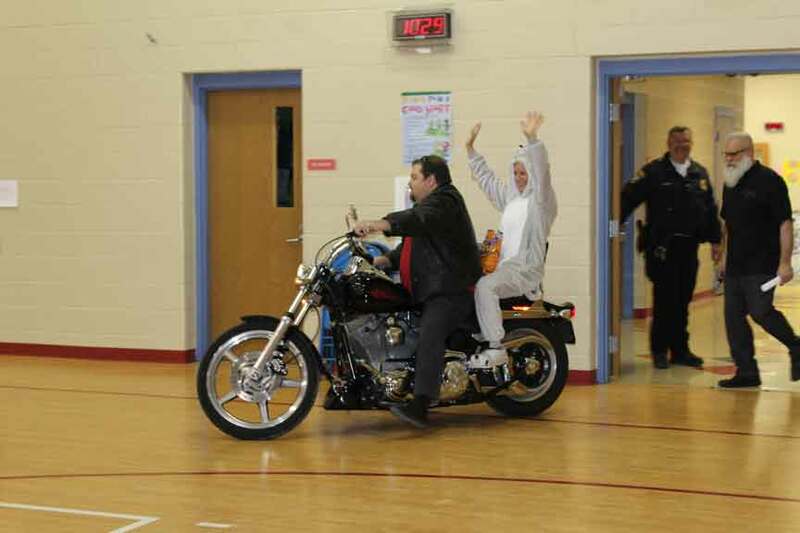 First-grade teacher Steve Daubenspeck rode an actual motorcycle into the gym, with third-grade teacher Julie Meyer dressed as a mouse and his passenger.